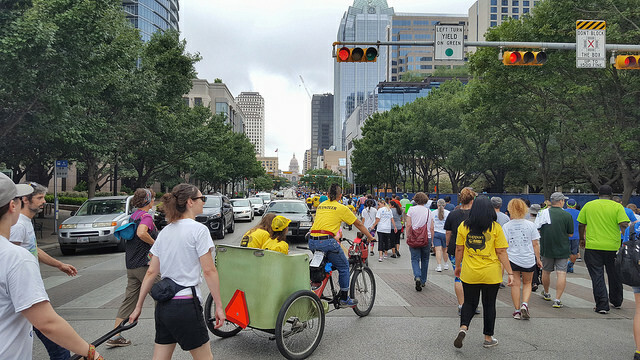 The National Alliance on Mental Illness’ Austin-based chapter sincerely honored Movemint in 2016 by asking if we could provide 4 of our pedicabs for their annual NAMIWalk. 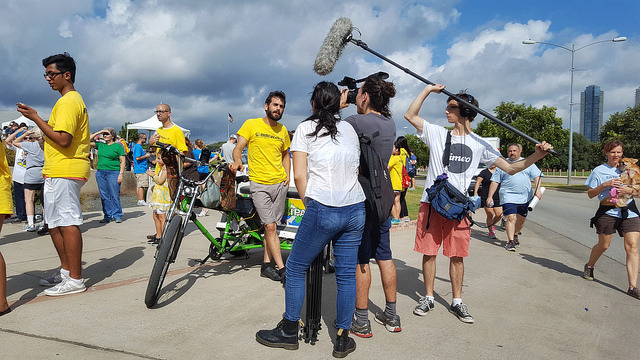 The annual NAMI Walk is attended by local politicians, celebrities and thousands of Austinites to raise awareness of and funding for programs to prevent suicide, and preaches tolerance and acceptance of those diagnosed with mental disorders. The walk started at the lawn of the Long Center for Performing Arts, circled the Texas Capitol, and returned to the Long Center. Pedicabs might seem like a strange inclusion, but pedicabs actually have a long history of participating in parades. Passengers, whom are never charged for the service, are typically (and in no particular order) the elderly, the less mobile, young children, and generally people who want to participate but have a lessened ability do so. All are welcome to ride. Perhaps because of our prominence, most of us were interviewed by local journalists or otherwise featured in interviews. I was interviewed by a student journalist from a nearby high school about my participation. It was kind of cool. People were universally pleased we were there. That was extremely cool. 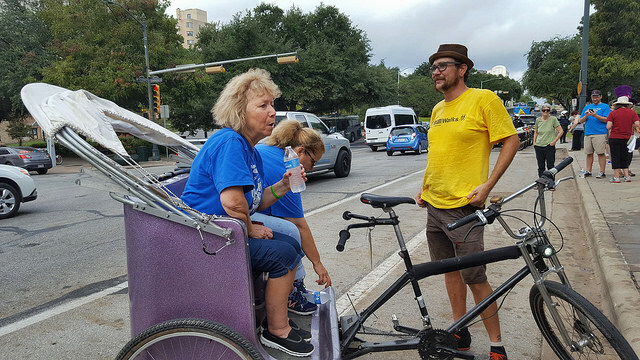 The organizer requested we provide the same number of pedicabs for the 2017 Walk, which begins in less than eight hours. We have a photo album available of Flickr here.